You know it might be Michigan in the winter when you are excited that the temperature is UP to 0° but the best thing to do is hunker down and sew! I haven’t posted much lately, because, frankly, I’m doing the same thing day after day. 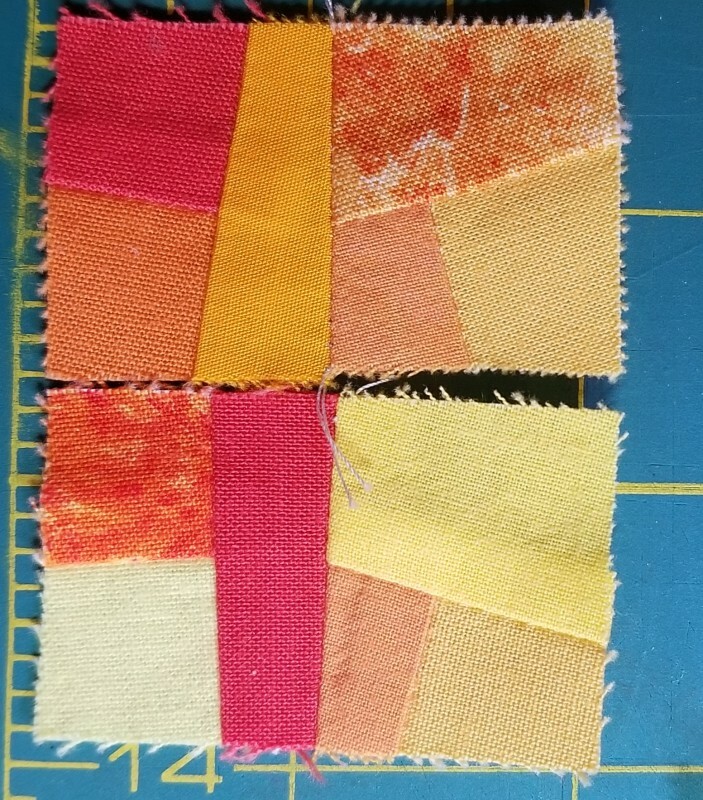 I’m working on “Autumn” which has finished squares of 3/4″ so are being cut at 1.25″ and although some might think it’s tedious to work this small, I’m enjoying it. It is, however, hours and hours of making design decisions, so I thought I would let you in on the process. Nope. If long sides are together they look clunky when sewn in. Next. Nope. Again with the long sides…but colors are good, so rotate one block or the other. 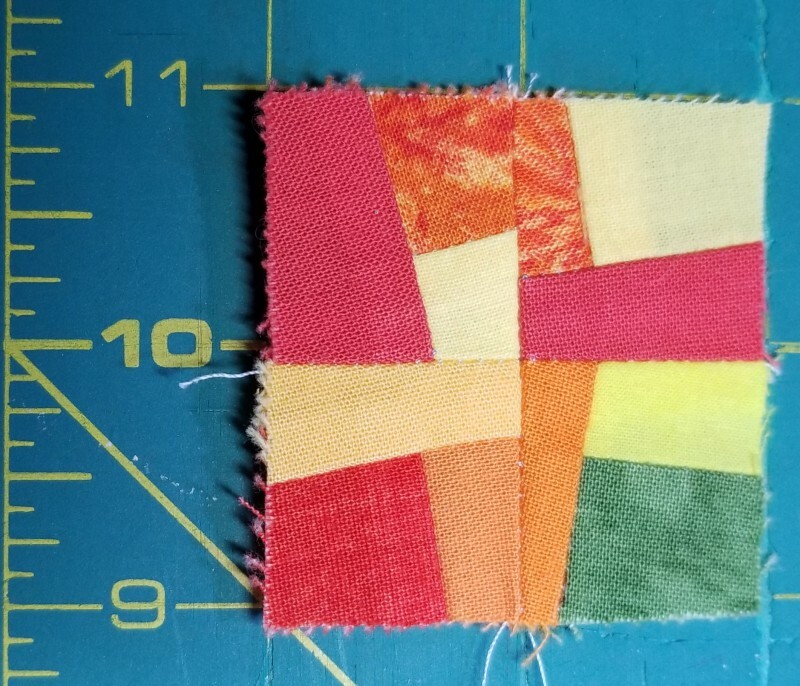 16-patch with blocks rotated and sewn. 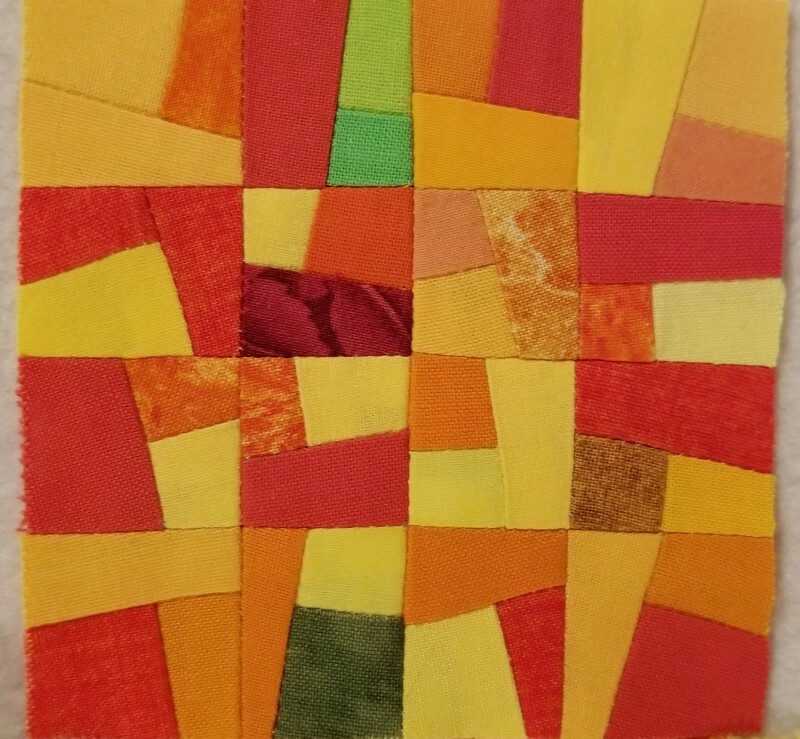 Currently 3.5″ and will be 3″ square when sewn in. Likely where they will land in the autumn colors. There you have it so far. 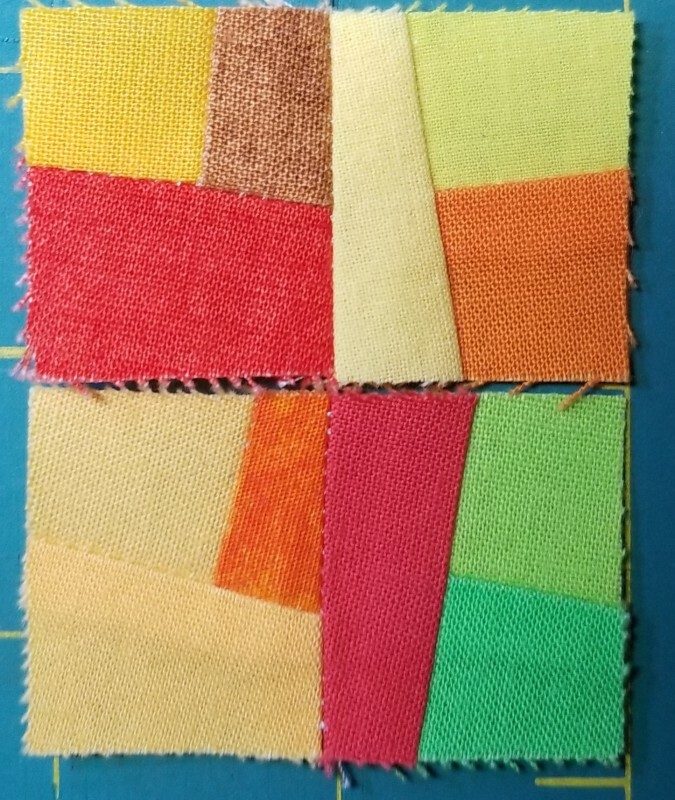 I’m calling this process “Structured Improv” as the structure is really like any quilt block you have, regardless of size, pattern, or even color. I like working with “blocks” of any size when the design process is working on balance as you create. 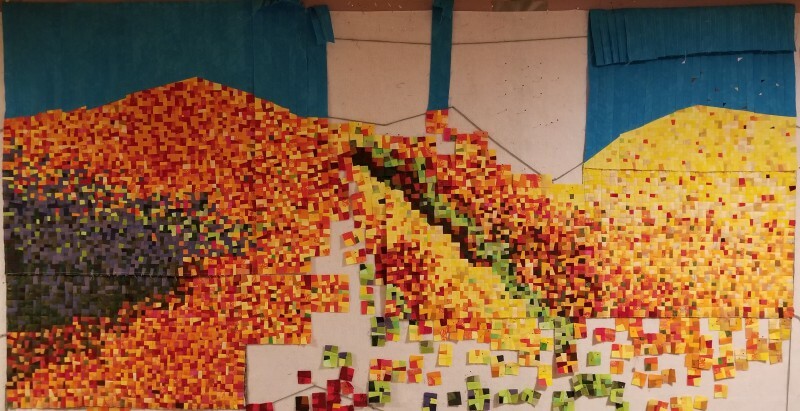 With a work this size, roughly 75″ wide x 65-70″ when complete, it’s critical that balance is always at the forefront of your thought process. 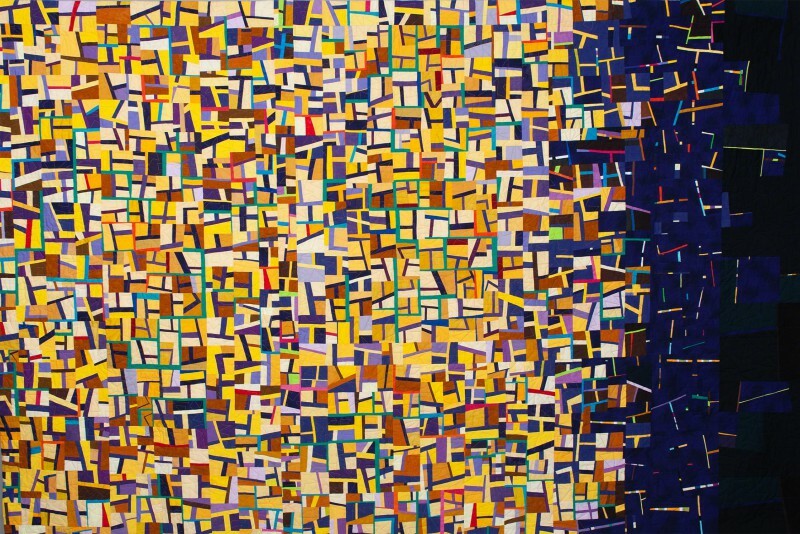 Without balance, this piece would be very “clunky” and I don’t really know what other word to use – a well-designed piece of art allows your eyes to dance over the piece – it draws you in to look closer and closer. Clunky is something that STOPS the eye, or interrupts the balance of a piece, whether sewn, painted, photographed, or sculpted. Grandma’s Candy Jar. Yes, that is paper-pieced. Yes, I did set it on point, and nip each of the neon pink corners off on purpose, and yes, it’s a Karen Stone NYB, and yes, I got her permission! 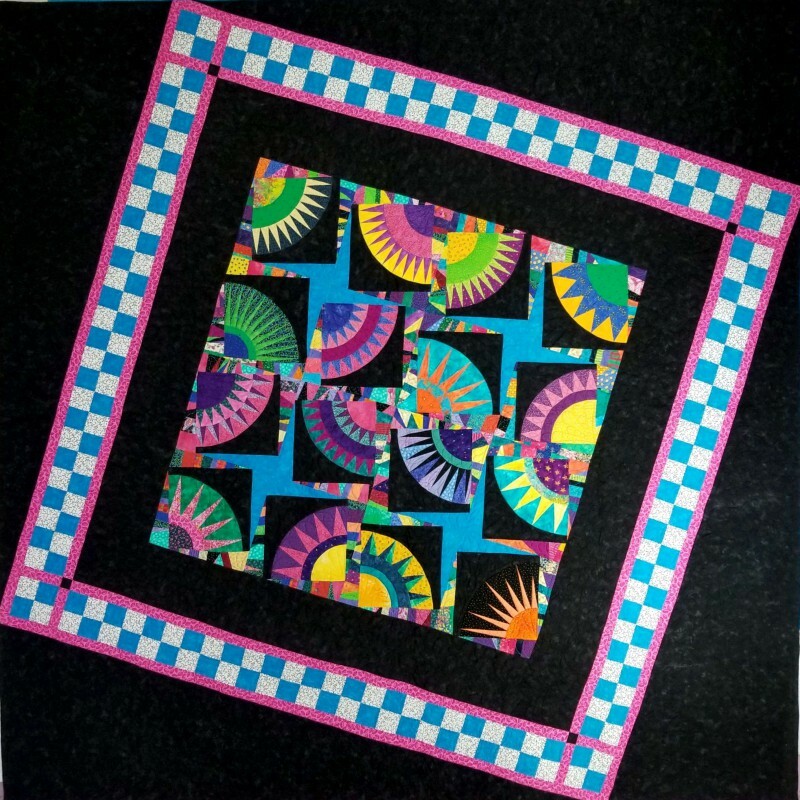 Yes, I am over the moon about both quilts being juried into shows, as crazy-different as they are! It’s a little like my cooking – I never want to get stuck in a rut, so I’m always reading, looking, and trying different things.